We’re in Epcot’s Italy Pavilion, and that means it’s GELATO TIME!!! 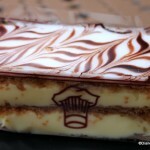 Unless, of course, it’s pizza time, but for now we’re just going to focus on the sweet stuff :). 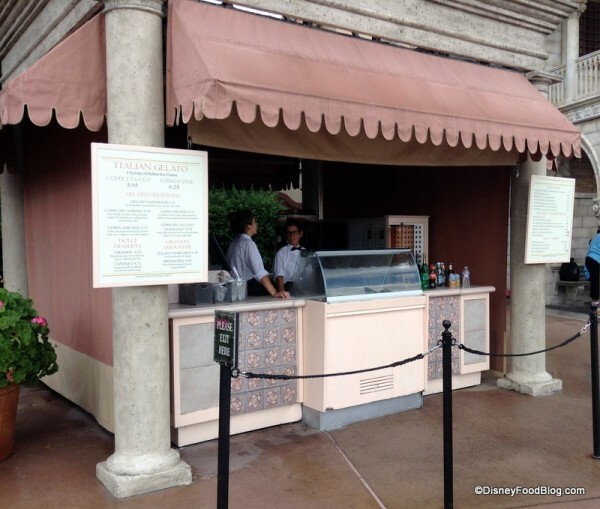 Italy’s simple Gelato Stand is located just before you enter the Pavilion coming from Germany. 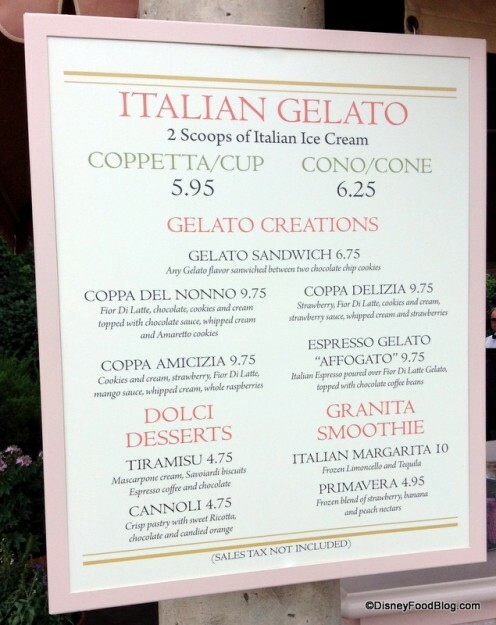 We’ve enjoyed grabbing Gelato Ice Cream Sandwiches during a stroll or two around World Showcase, and you can always get a scoop of your choice of gelato in a cone or cup. 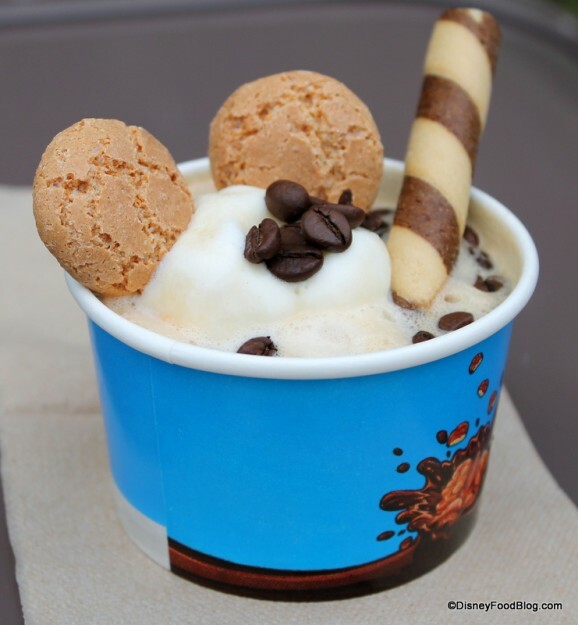 You’re getting a few treats in one here: a scoop of vanilla gelato, a shot of espresso, and several accompaniments: two simple cookies, chocolate coffee beans, and a wafer “straw”. 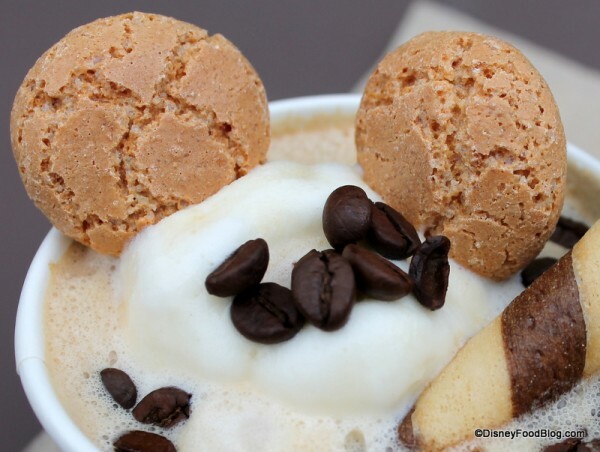 By the way, am I right that the cookies stuck just so into the scoop of gelato make a Mickey? 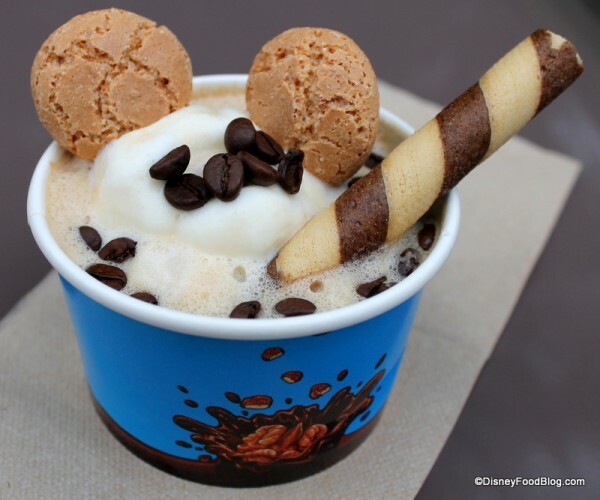 Affogato means “drowned,” and that pretty much sums up the consistency of this gelato creation. The weird thing is, even though it says “drowned” on the menu, I still wasn’t quite prepared how very liquefied it would be. You can see in the pictures how the gelato nearly floats in the espresso. 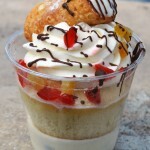 Between the generous pour of espresso and the typically muggy FL weather, this dish becomes “gelato soup” very quickly. 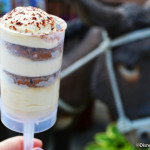 I was drinking as opposed to scooping it by the end! Which, thanks to the very intense coffee flavor from the espresso and the coffee beans, didn’t feel entirely unusual. I almost wonder why it’s not served in a tall plastic glass. 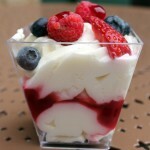 Overall — while this is a high-quality, well-crafted dessert – it’s still difficult to recommend it at its price point of $9.75, even considering how many components go into it. Where the Coppa Delizia is GIGANTIC and can be easily shared between two people (potentially bringing a tremendously satisfying dessert to about $5 apiece), the Gelato Affogato doesn’t have that same power of portion. Plus, I don’t know about you, but any cold, sweetened (in this case by gelato) coffee beverage lasts about 10 seconds in my presence. It’s over too quickly to justify spending close to 10 dollars for it. In any case, though, we’ve had some gelato and learned a little Italian, to boot. Life is still good in the Italy Pavilion 🙂 . Ciao, for now, friends! 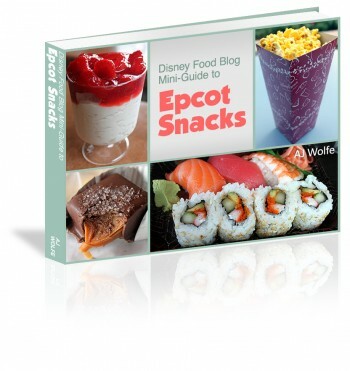 Want Even More Epcot Snack Suggestions? 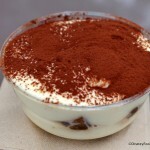 Would you try any of the “Creations” at Italy’s Gelato Stand? Please let us know with a comment! Dominique Ansel recently debuted a “Wafflegato”. Between this and the faux cronut offered in the Refreshment Port, I wonder if the legendary cookie shot can be far behind. Maybe in the American Adventure?